Everyone who is following me on my instagram or twitter account already saw that I have been into eating and cooking a lot lately. I went out to eat, met up with friends for brunch or baked bread to calm down after a long day of school :) But it wasn't until two weeks ago, my boyfriend had the idea of making our own pasta as well. 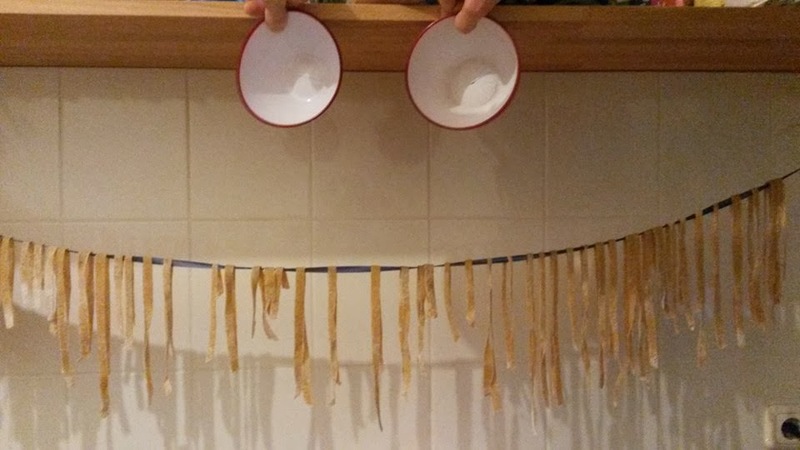 So, today I am actually sharing his recipe :) Both of us always wanted to do this one day, but we do not own a pasta machine, so we thought: hmm.. might be too strenuous, but hey! if you put some effort and time in it, it's actually NOT! Make this an event with friends and family, get together, make your own pasta and cook different sauces to eat with :) I promise, this is so much fun!!! 1. Mix all ingredients together and knead until you have a nice dough. Add so much of water that the dough does not crumble. It should not be liquid either. 2. Shape a ball and put it in a bowl. Let it sit in your refridgerator for 30minutes. 4. Now it's up to you, are you hungry and wanna have some pasta immediately? Then cook some in hot water, but be aware: they only need 3 to 4 minutes to be al dente ;-) If not: you can hang them on a cord and let them dry, so you can enjoy them the next days. That was it! Cook your different sauces and invite some friends over to share them :) I also have to say that these are super filling! because they are whole-grain, so have an empty stomach ;-) That night, I had my pasta with some sautéed zucchini, onion and green pesto :) The pasta definitely tastes different, but really really good and I think, it makes a difference whether you actually know what's inside your food instead of guessing what these chemicals at the back of the package mean. Mindful Monday: Let's go for a run! Mindful Monday: Stress as my Friend?